The song was first recorded by Nat King Cole on 22 August 1947 with a studio orchestra. It was released on 29 March 1948 and became a big hit beginning in mid-May, topping the Billboard Best Sellers in Stores singles chart for seven weeks. 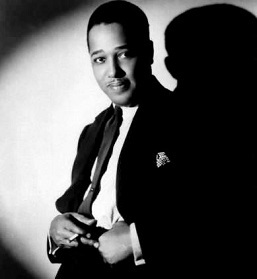 The songwriter, eden ahbez (no capitals by his preference), had handed a “tattered piece of sheet music” to Cole’s manager backstage during a gig at Downtown L.A.’s Orpheum Theatre in June 1947. Cole began playing the song during live performances sometime between receiving it in June and recording it in August. The song tells a fantasy of a “strange enchanted boy… who wandered very far” only to learn that “the greatest thing… was just to love and be loved in return”. 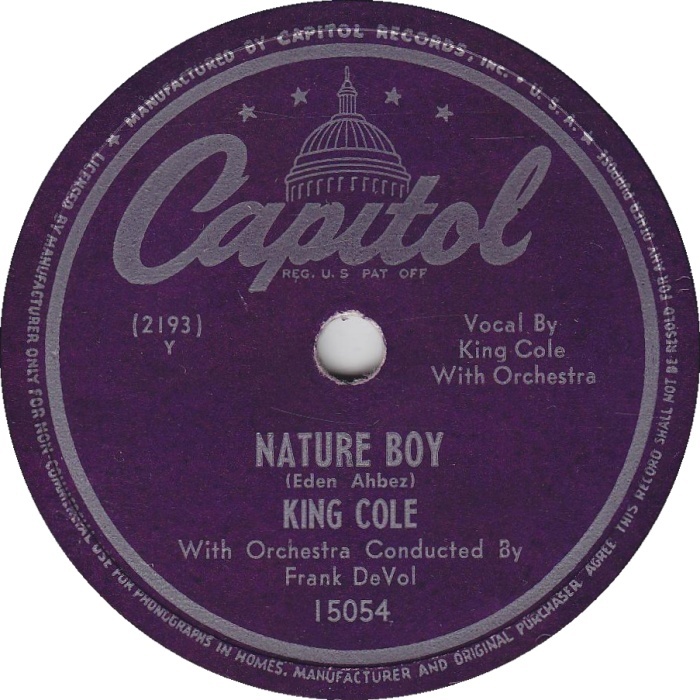 Nat Cole’s 1948 recording of the song was a major hit, and “Nature Boy” has since become a pop and jazz standard, with dozens of major artists interpreting the song. The first two measures of the song’s melody parallel the melody of the second movement in Antonín Dvořák’s Piano Quintet No. 2 in A, Op. 81 (1887). It is unknown if Ahbez was familiar with Dvořák’s piece, or if he arrived at the same melodic idea independently. 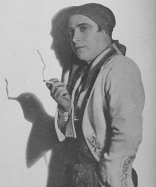 Yiddish theater star/producer Herman Yablokoff, in Memoirs of the Yiddish Stage, claimed that the melody to “Nature Boy” was plagiarized from his song “Shvayg, Mayn Harts” (“Hush, My Heart”), which he wrote for his play Papirosn (1935). Ahbez protested his innocence, claiming to have “heard the tune in the mist of the California mountains,” but later agreed to pay Yablokoff $25,000 in an out-of-court settlement. The tune of his [Yablokoff’s] song “Shvayg mayn harts” (Be Still, My Heart) became popular in English as “Nature Boy” when it was allegedly appropriated by a Hindu mystic in California who dabbled in songwriting. You may read details regarding the Yablokoff claim in a biographical sketch of eden ahbez by Brian Chidester, titled A Strange Enchanted Boy, published in the Chidester blog Eden’s Island. While the most recent version of the bio is dated 2 March 2012, I originally found a version of it, dated 2006, on a page of “Cafe L.A.’s Blog,” a now evidently defunct (or perhaps renamed) Chidester outlet, at Myspace.com. 1. Capitol Records single 15054, b/w “Lost April,” recorded on 22 August 1947 by the King Cole Trio with a studio orchestra, arranged and conducted by Frank De Vol. Released on 29 March 1948, it spent seven weeks at #1 on Billboard’s Best Sellers in Stores chart from 15 May to 26 June that year. 2. perhaps from The Nat King Cole Show – 56-57. IMDb lists some of the episodes and songs performed in them, but I don’t find this one. Grace Slick & The Great Society – recorded 1966, released on their second album How It Was, 1968. The track reappeared on the 1971 collection Collector’s Item which was simply a combination of the 9 tracks from their first album and the 8 tracks of the second album, in the same order except that the second album’s tracks appear first. The Great Society disbanded in late 1966 when Grace Slick left to become the lead singer of Jefferson Airplane, replacing the departing Signe Toly Anderson who left the Airplane for personal reasons. Will-o-the Wisp – from A Gift for Your Dreams, 2007 — Cut by a neo-prog band heavily in debt to 1970s-era Genesis and Pink Floyd. I know Gypsy Boots claimed throughout his life that he, not ahbez, was the inspiration for “Nature Boy.” To that end, ahbez told friends over and over that Boots was a phony. 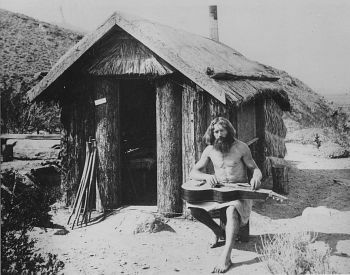 Ahbez would sleep outdoors in Topanga Canyon and often went off with his Nature Boy pals to the desert caves of Tahquitz Canyon, near Palm Springs. 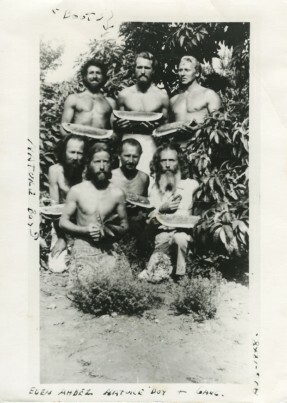 It was in Tahquitz Canyon that Ahbez would encounter his mentor, Bill Pester, a German immigrant who taught radical philosophies of the day, including nudism and natural medicine. It is likely that Ahbez also discovered Eastern philosophy and mysticism during this period, adopting the name “eden ahbez” (and choosing to spell his name with lower-case letters, claiming that only God was worthy of capitalization). 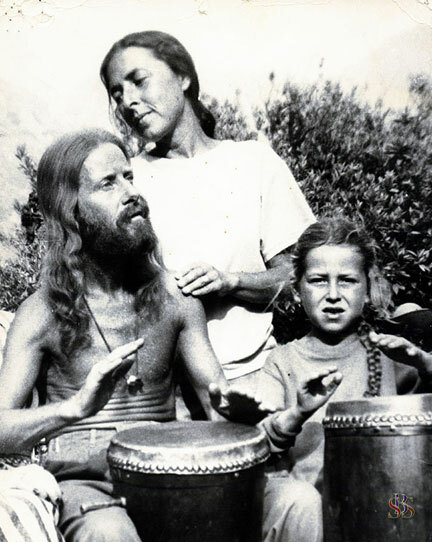 For more information on the pre-hippie movement in Germany and Southern California, Gordon Kennedy’s Children of the Sun* is a primary text. Another crucial figure was Bill Pester (b 1886) who fled from Germany to the US in 1906 to avoid military service. 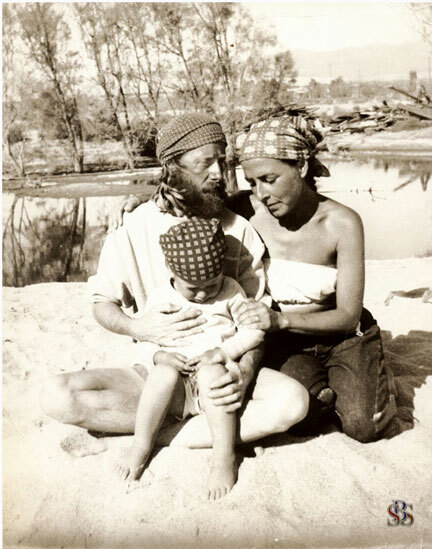 A confirmed naturmensch, he lived with the Cahuilla Indians in the Coachella Valley – where he had an organic farm. 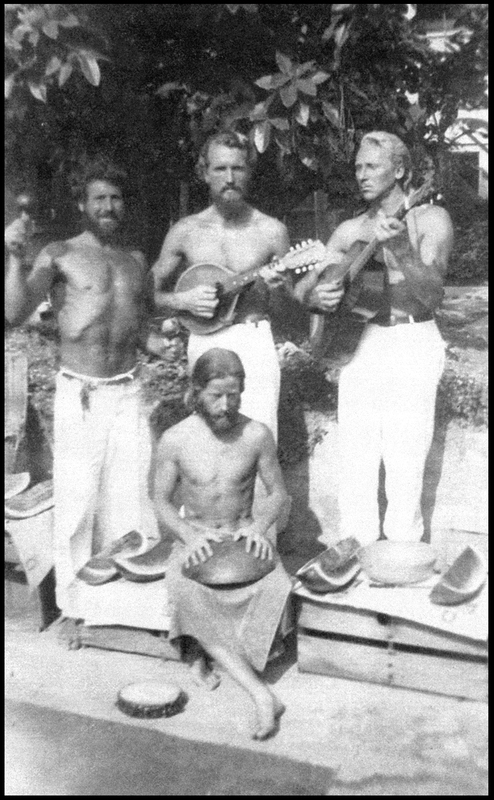 It was meeting Pester that changed the life of Eden Ahbez (b 1908): a born wanderer from an early age, he settled in California during the late 30′s, part of a group of ‘nature boys’ that congregated around John and Vera Richter’s live-food cafe, Eutropheon, in Los Angeles. Gypsy Boots and others have claimed to be the inspiration for Nature Boy but eden was very specific and very grateful. Thanks, but with “an antenna of irrefragable insight” I sense likely anecdotal embellishment. Did I write that the lineage from “Sveig Mein Hartz” to “Nature Boy” was “mercurially concrete” somewhere on the internet? If so, I remember it not. But I’d say that is probably the best word to use for the melody, since “mercurially” suggests causality and even thievishness, both of which that melody seems to contain. When I had an ethnomusicologist play it for me on piano (from the sheet music), she pointed out that such a melody was typical of Eastern European folk balladry for many centuries and that its sequestering by the overlords of 20th Century copyrighting, as usual, laid claim to something that originated with neither of these very interesting characters (Yablokoff and ahbez). But I’d say that is probably the best word to use for the melody, since “mercurially” suggests causality and even thievishness, both of which that melody seems to contain. It is not the melody which was described as “mercurially concrete,” but rather the consensus (of theories as to its origins) that the song is a derivative of the European folk music tradition. First of all, the cited article, Eden Ahbez Bio by Cafe L.A. on Myspace, is presently dated March 17, 2012, whereas I quoted from it in February 2011, almost two years ago. It was evidently modified in the interim. In fact, I vaguely recall seeing the bio at two distinct sites c. February 2011, so I might have quoted from two separate versions of it without noticing the variance. Whether the phrase “mercurially concrete” is an appropriate one is a minor question, which I’ll come back to. More significantly, I think the relevant section of the bio convincingly exposes Yablokoff’s claim of copyright as a very weak one, presuming your summary of the facts is accurate. Where’s the evidence to corroborate his claim? 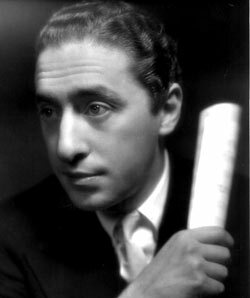 The speculation that ahbez might have come into contact with the Yiddish theatre during a period when he lived in New York in the late 30s seems like grasping at straws, clinging to a remote possibility which might lend a splinter of support to a feeble case. However, these points only address the chain of possession of the manuscript, and not the writing of it which is the main area of contention. I’m far from convinced that the number came mystically to ahbez in a cave, and I would probably tend to side with the musicologist you mention if forced to cast a vote. However, until someone traces the song to a specific traditional precedent (or two), then ahbez’s claim to authorship will probably continue to stand, and rightly so. Getting back to “mercurially concrete.” I do not find that phrase in the present version of your eden ahbez bio at my source, and will be glad to remove it if you wish. Common synonyms for mercurial include capricious, changeable, fluctuating, impermanent, unstable. That’s the sense of the word I had in mind when reading it. Concrete, with respect to evidence or information, means solid, substantial, factual. They aren’t exactly opposites (an oxymoron when combined), but when paired together it’s hard to escape the impression that the sense of fluidity denoted by the former word has been juxtaposed against the sense of solidity suggested by the latter. I presumed that you had used the phrase for ironic effect, but wasn’t quite sure of your intention or meaning. The Wikipedia is just flat out wrong. Wherever Mercer came into the story (if at all), it’s not at the Lincoln Theatre. There are about twenty newsprint items from the summer of 1948 citing Otis Pollard, Nat Cole’s valet, as being the person ahbez spoke to and the one who handed the music off to Cole in 1947. And these same articles state that Otis Pollard was allotted 12.5% of the publishing for his role in the handoff. From there it’s a ramble, not even close to the finished 1947 version and not inclusive of the famous line: “To love and be loved in return.” Knowledge up to this point regarding the writing and recording of “Nature Boy” has been mostly factually inaccurate and greatly mythologized. I’ve updated a few of my blog posts to be factually correct, but as I’ve collected over 500 pages of research on just that song alone, I’ve chosen not to try and surmise that information for an online blog, but rather to pursue a publishable biography on ahbez’s entire life. That being said, there’s nothing factually untrue on the current version of the Cafe L.A. MySpace blog post. This post was revised, for the sake of simplicity, on 13 June 2017, and again on 19 June 2017. There is no indication by Wikipedia that Mercer was anywhere near the Lincoln. Perhaps Mercer or Capitol suggested that ahbez send or deliver a copy of the manuscript to Cole, whereupon ahbez took it upon himself to deliver it personally. Mercer/Capitol might have told the songwriter where to find Cole, or ahbez might have easily discovered where Cole was working via the entertainment section of a local newspaper or a trade magazine. Do you have a quote from Cowboy Jack Patton on the matter? Was he under contract with Capitol?. Very helpful, yes. Thank you. I should have mentioned that I haven’t really tried to verify either of the two versions I’ve mentioned of when, where, and how Nat King Cole acquired a manuscript of the song, nor have I studied the relevant biographies, or dug up pertinent 1947 news articles as you have. I commend your expertise in these matters, conceding that it is vastly greater than my own. I am merely an upstart novice on the subject of Nature Boy, whereas you’ve evidently invested much time and diligent effort sorting through the facts and fictions surrounding the song’s history. Thank you very much for sharing some of your knowledge in this area. It’s greatly appreciated. The only thing I might add regarding Johnny Mercer is that, according to Herb Jeffries, who also recorded “Nature Boy” in 1948 during the Petrillo musicians strike, ahbez offered the song to more people than he could probably count. And with each offer, ahbez promised those artists and mediators a piece of the royalties. How true all of this is… hard to say. Cowboy Jack Patton, a Western radio host and lifelong friend of ahbez’s, claimed that he was the one who got ahbez in touch with Cole’s management. How long after the drop-off at the Lincoln it took for Cole to recognize the song’s value, or whom ultimately brought it to his attention amidst the pile of other songs Cole no doubt received, may be forever lost to time. If Mercer had anything to do with Cole recording “Nature Boy,” which is totally conceivable, I have only ever heard that suggested by Youngbear Roth, who claims that ahbez himself said as much. Youngbear, a friend of ahbez’s during the 1970s and ’80s, became very zealous, about a year ago, to let anyone who would listen know that little factoid. He told me and I told him what I’m telling you here. But I think his side of things influenced the Wikipedia writers. Again, I’m not dismissing it. I think it’s very likely that Mercer heard “Nature Boy” and being at Capitol Records could have easily played a role in Nat Cole choosing to record it. I’ve just not found conclusive evidence for that yet. Here’s the thing: The mythology changed a lot over the years and details were added by friends and family members of both Cole and ahbez long after the event. What I found, in going back to the original press write-ups from the spring/summer of 1948, is that Otis Pollard was the name attached to the manuscript hand-off in almost every instance and Irving Berlin was the celebrity artist who supposedly heard Cole perform “Nature Boy” in a nightclub before recording it and had his company buy the publishing. Like I said, Pollard retained 12.5% of the publishing for his role (which he apparently sold later in 1948) and Irving Publishing held partial rights to “Nature Boy” for many years until ahbez won back the rights in a series of lawsuits. But the Pollard/Berlin stories were the ones being described to the press when “Nature Boy” was actually on the charts and, therefore, withstood all opportunity to dispute their veracity, as ahbez and Cole were interviewed hundreds of times during those 15 weeks that “Nature Boy” was on the charts. How Herb Jeffries, Cowboy Jack Patton and/or Johnny Mercer, or, hell, even Nat Cole’s manager, Carlos Gastel, were involved is not so clear. But considering the song was first printed in 1946 and finally released two years later, it’s not unlikely that the manuscript came to the attention of many industry specialists. That being said, once “Nature Boy” entered the annals of songwriting history, it seems endemic that many would lay claim to some part of its unthinkable story. I know Gypsy Boots claimed throughout his life that he, not ahbez, was the inspiration for “Nature Boy.” To that end, ahbez told friends over and over that Boots was a phony. Welcome to the strange, enchanting world of eden ahbez. 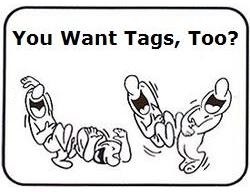 Your rigor in these matters is much appreciated. Common synonyms for mercurial include capricious, changeable, fluctuating, impermanent, unstable. That’s the sense of the word I had in mind when reading it. Concrete, with respect to evidence or information, means solid, substantial, factual. They aren’t exactly opposites (an oxymoron when combined), but when paired together it’s hard to escape the impression that the sense of fluidity denoted by the former word has been juxtaposed against the sense of solidity suggested by the latter. I presumed that you had used the phrase for ironic effect, but wasn’t quite sure of your intention or meaning. I’d heard the phrase “mercurially concrete” used once in reference to something that is of definite ambiguity, which I applied to “Nature Boy”/”Schveig Mein Hartz” because it seems easily applied and claimed as one’s own, if the musicologist is correct. So, yeah, I guess the phrase IS something of an oxymoron, though I didn’t think to call it that or to use the term ironically. I just liked the way it sounded and I, indeed, think the original melody to “Nature Boy” and “Schveig Mein Hartz” may be forever be lost to time. But I keep searching.